Prospective buyers can be forgiven for some trepidation when approaching this disc, Christoph Eschenbach is not widely known as a Brucknerian, and his Mahler readings can best be described as 'controversial'. He's a method man, who excels in German precession and finesse but often at the expense of the music's passion and humanity. That's fine for the modern music that he seems increasingly to be turning to, but for Bruckner? 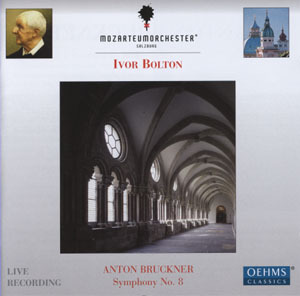 As it happens, this is not his first Bruckner 6 on CD. There is another with the Houston Symphony that was released in 2001. And listening to this new version, it is clear that he knows the score like the back of his hand. And the results are great. 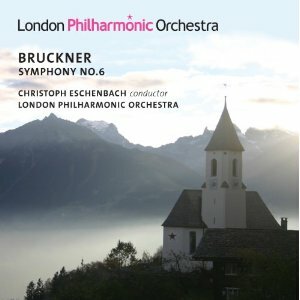 The 6th is, after all, the most tightly constructed of Bruckner's symphonies. That isn't saying much but it does mean the score responds very well to Eschenbach's disciplined approach. The clarity of the orchestral textures is his overriding priority, but he is also looking for cleanly articulated phrasing. And while precision is the watchword, the music is never mechanical or lacking in grace. True, his rubato is more constrained than that of other Brucknerians, but it is there all right, and he is sure to slow down into a climax whenever the dramatic shape of the music requires it. Another important factor in the success of Eschenbach's reading is that he never takes anything too fast. We are usually just a notch slower than the average tempo in each movement, although there some wonderfully brisk passages in the first movement that also come off really well. But steady tempos combine well with the conductor's focussed, detail-rich approach to create both intensity and scale. Some may hanker after the more emphatic climaxes that you meet in Furtwängler-era recordings, but Eschenbach demonstrates that it works just as well without. And unlike some of his predecessors, he doesn't make any excuses for the coda of the last movement. That is the one structural weakness of the symphony, and other conductors often compensate by ratcheting up the final bars into a monumental climax that the notes on the page don't quite justify. By not doing so, Eschenbach risks an anticlimax at the end, but even then it doesn't feel right to put all the blame on him. The playing from the London Philharmonic is superb. There isn't a single section of the orchestra whose performance ever drops below the superlative. One of the greatest strengths of the LPO is its low strings, and their clarity and sheer power provide an impressive foundation for this music. The brass too are on top form, plenty of power from the trombones, punch from the trumpets and subtly from the horns. The horns have a busy time in this symphony, and there are many details of their parts, for example the question and answer interplay between the desks, that I've never heard before and that sound great here. The sound quality too is very good. The refurbished Festival Hall is turning out to be a great recording venue, both warm and detailed in its recorded sound. Why no SACD? Many, if not most, orchestra own labels have adopted the technology and in most cases have done their own playing more justice as a result. This recording is crying out for the full SACD treatment. Fairly cursory programme notes too. Still, this is a lower end mid-price release, so you can't ask for miracles. It's a great recording though, and worth every penny. Highly recommended. the sound quality is very good for its time, and possibly on a par with Solti's cycle, although the technical problems here are different as it is a live rather than a studio recording. 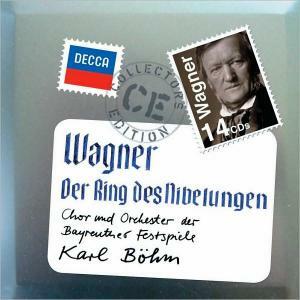 For most Wagnerites then, it is a straight two horse race between Solti and Böhm. In fact, the two sound very similar, and with good reason. These live recordings were made at Bayreuth in 1966-7 and many of the singers (Windgassen, Neidlinger, Nilsson) also appear on the Solti, which was completed only the previous year in 1965. By the mid 1960s, Decca were clearly world leaders in sound reproduction technology, and the singers in both cycles are served extremely well by the audio, although the orchestra is not as well recorded here as in the Solti, a consequence of the opera house venue. The most important similarity between this recording and its predecessor is the approach taken by their respective conductors. Like Solti, Böhm is a control freak when it comes to Wagner, and everything here is coordinated with an iron grip from the podium. Both conductors are able to create real architecture from the symphonic shape of each of the acts, and also to ratchet up the suspense at each of the climaxes. Both conductors prioritise drama above all else, and in this sense Böhm has the upper hand. This may be because he is conducting a staged performance, or perhaps it is down to the insights the main singers brought from their time with Solti, but for whatever reason, Böhm makes you feel you are in the orchestra stalls. That's an important asset, although perhaps not the clincher. The major criticism you'll read time and time again of Böhm's Ring Cycle is that his tempos are too fast. That is a fair judgement, but listening to long stretches of these recordings, it is clear that Böhm has thought through how these fast tempos will work and interconnect, meaning that he is able to generate both dramatic momentum and structural continuity through his often radical pacing. Many of the set pieces – particularly the Rheingold Prelude and the Immolation Scene, feel breathless and even mechanical when heard out of context, but when heard at the start and end of whole acts that are performed this way, they make perfect sense. And it's not all taken at record breaking speeds; Siegfried's Funeral Music is surprisingly slow, and actually quite limp in places. All the singers give virtually flawless performances, at least to my ears, but they don't all cope as well with Böhm's relentless pace. One or two, and I'm thinking in particular of Theo Adam as Wotan and Birgit Nilsson as Brünnhilde, sound cold and emotionless for long passages. It is hard to judge whether it is the conductor or the singers who are to blame. Certainly, Nilsson would have put in a more moving performance if she had been permitted a little more rubato. Some of the singers push in the opposite direction, giving intense emotion whether the conductor likes it or not. Anja Silja, for example, piles on the vibrato and coloratura as Freia, but her excesses don't necessarily balance Böhm's discipline. James King and Leonie Rysanek do better as Siegmund and Sieglinde, both following the letter and the spirit of Böhm's direction, making Die Walküre the opera in the cycle were everything adds up thanks to a real unity of intent between the stage and the pit. Dramatically, the most convincing performances are from the bad guys. Gustav Neidlinger is as sinister an Alberich as you could want, and Josef Greindl puts in a similarly show-stealing performance as Hagen. One major advantage Solti has over Böhm is the Vienna Philharmonic. The Festspielorchester here are certainly good, and as you'd expect, they demonstrate an intimate knowledge of the music. But their woodwind soloists aren't as distinctive, their strings don't quite manage the same fullness of tone, and their trumpet section has a nasal timbre that can get quite annoying after a few minutes. The audio doesn't help them, and the thin sound, especially from the back of the pit is the one major disappointment of this cycle. Another curious anomaly is the almost continuous audibility of the prompter, giving each of the singers their lines a few bars before their entry. I can only assume that Decca let this pass the first time round because home audio equipment then wasn't quite what it is today. In fairness, you have to turn it up high before it is a real problem. But if you are listening on good headphones it is even more evident, and difficult to ignore once you have noticed it. The budget price reissue has its pros and cons. The main pro is the price, and while this isn't the cheapest Ring cycle on the market, it is the cheapest one that is worth buying. It also significantly undercuts any Solti remaster, which may be a determining factor for some. The packaging has been designed to resemble some sort of metal briefcase or tape canister, they are obviously pushing the archive angle. Wagner's face appears on a postage stamp, which doesn't make much sense to me. Inside, you get a small booklet and the discs each in plain paper slip cases. The booklet contains cast lists, synopses and an essay by George Hall. Impressively, and unusually even for historic reissues, the essay is about the recording rather than the work and is very interesting, although it could do with being at least three times as long. So, what is the final verdict – Solti or Böhm? Most opera fanatics put the quality of the singing at the top of their list of priorities, and on that count I'd have to call a draw, not least because of the overlap in casting and the superlative performances that the singers give for both conductors. The orchestral playing and the audio from the pit is a significant problem, at least for listeners like myself who place Wagner's skills in orchestration above his many merits in other operatic fields. But then, if it is the orchestra you want to hear, you would be better off with Karajan or Haitink. Dramatic and structural integrity are the qualities that set Böhm apart from his fellow Wagnerians, and that sense of tight cohesion is increased for the buyer of this set by the fact that it comes in such a small, streamlined box. I can't in good conscience recommend this over Solti's landmark recording (even with the price differential), but I can recommend it on its own merits. However many interpretations of the Ring Cycle you have already heard, this one is definitely worth hearing. And to be honest, if you are even considering buying this set, you almost certainly own the Solti already. I'm not usually one to judge a disc by its cover, but this cover is very interesting. Signum are clearly hoping to appeal to new audiences with this sort of design. 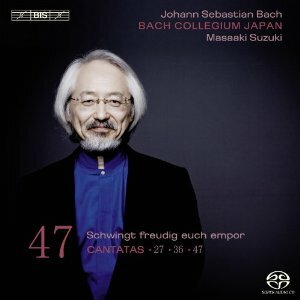 Hopefully the idea is to draw younger listeners into Bach's world, but it is more likely that they are aiming at the already established, and considerably more senior, crossover market. Image is clearly important here, it's not often you meet an endorsement ad for the choir's tailor on the back of the liner. And the liner itself is much more in the rock and roll tradition than the classical: it is a single sheet that unfolds to reveal a large, stylised image of the choir on the back, presumably to stick on your bedroom wall. The performances are good but are very much what the packaging would lead you to expect. The singing is crisp and accurate, but the tempos are often fast and unyielding. The polyphonic movements are sung with a ping to the accents of each note. Its not all unaccompanied, but it is all a cappella in style. Voces8 seem to be a Swingle Singers type of group, and their Bach is designed to highlight their vocal agility and the precision of their close harmony textures. The group is made up of former choristers from Westminster Abbey, so as you'd expect they really know the notes. They are joined by two female sopranos, who are good but are a mixed blessing. Obviously, boy trebles wouldn't fit into this kind of sexed-up Bach, but the female voices also stand out. They occasionally have some tuning problems as well, suggesting they are not quite up to the standard of their male colleagues. The choir have instrumental accompaniment, thanks to the Senesino Players (an orchestra named after a castrato, what are they trying to tell us with that?). But the instrumentalists take a back seat, partly through Bach's refusal to write them any independent parts, but more significantly through the balance of the recording, which clearly prioritises the voices. There are no movement divisions within the motets, and each occupies a single track. The way the motets are performed is similarly continuous, with very little pause between each of the movements. That may or may not improve the coherency of the result, but is less of an issue than the way that even individual phrases within choruses are run into each other. It is as if the producers are trying to avoid even the briefest of silences, which often robs the music of its poise. It lacks gravitas as well, but this is probably the point where individual tastes come into play. 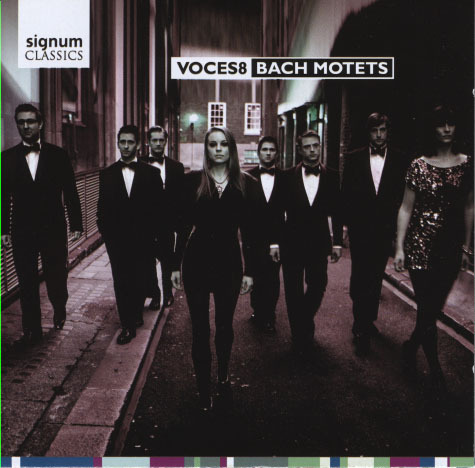 In their pursuit of new audiences,Voces8 and Signum seem unconcerned about alienating the existing Bach constituency. That is fair enough, you can easily go elsewhere if you want to hear a more traditional reading of this music. But what this one offers is fun. The period performance movement has demonstrated how to bring life and energy back to Bach's choral textures, but none of the big names have produced anything that is quite as fun as this. Obviously, this isn't the last word when it comes to Bach's Motets, but it brings an interesting new angle to the music, and possibly a new audience too. 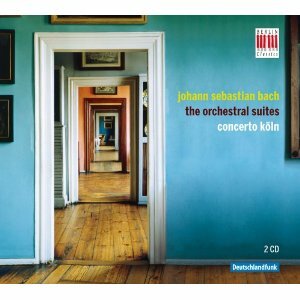 Precision is the watchword in this new recording of the Bach Orchestral Suites from Concerto Köln. The recording quality is good, the internal balance of the ensemble is finely judged, and the tempos are excellently proportioned. The recording has been released to mark the 25th anniversary of Concerto Köln. That pedigree really shows, and it would be difficult to imagine a baroque ensemble with greater unity of artistic intent. Conducting duties are shared between three of the players, an excellent compromise for repertoire that needs a guiding hand but that can suffer from the egotistical interventions of a conductor in the 19th century sense. And while the tempos and dynamics are fairly steady, there are also a good number of subtle ralls and caesuras that no doubt require some kind of coordination from the front of the stage. The orchestral sound is always elegant but never flamboyant. Each of the wind instruments adds a distinctive colour to the mix, but even in the tuttis there is never any suggestion that they are obliging the strings to play above their optimal dynamic in terms of timbre, and when you add trumpets into the mix that is no mean feat. The continuo takes a back seat, which may or may not be appropriate to the repertoire, but the occasional tinkling sounds of the top end of the harpsichord can have the frustrating effect of reminding the listener what they are missing in the bass. Most of the playing is characterised by very smooth articulation, which aids the phrasing, although perhaps at the expense of the textural variety. But there is a deeper problem with this recording, one that is frustratingly difficult to pin down. Everything is so precise and measured that somehow all of the excitement gets lost. Timbre may play a part in this, like the smooth legato, the roundness of tone of almost all the instruments means that there is no edge here. I'm glad that the contrapuntal lines are not overstated, but these players often go too far the other way, taking the intricate textures for granted in the hope that they can speak for themselves. You often have to listen very hard indeed to make sense of these textures – of course you should be listening hard to any Bach you put on, but the demands made on the listener here are extreme. Then there is the pitch. The players work to the so-called French pitch of the day a=392hz, which is very low indeed. I'm impressed that the players can maintain there exceptional intonation standards at this unusually low pitch, but I'm also concerned about the overall effect on the music. The tone colour is duller than your ear is conditioned to expect by other recordings, and the lower pitch has the effect of lowering the temperature all round. I don't quite know where the whole issue of authenticity fits into this picture, although I suspect the pitch standard in particular is the result of some speculation. If you are tired, and many are, of Bach recordings that go out of their way to make everything exciting and new, then this more level-headed approach may be for you. And as I say, there is little, in fact there is literally nothing to fault here from a technical point of view. But it is one for serious Bach fans only, and I can't see it winning him over any new listeners. This isn't the first CD to feature the voice of Argentinian countertenor Frano Fagioli, but it is clearly intended as a career launcher. And it hits all the right buttons; after hearing it you just want to hear more of this remarkable voice. The countertenor voice is often associated with thin, nasal sounds and emotionally neutral, or at least restricted, interpretations, but there is none of that here. The repertoire may be baroque, but it is Italian baroque, and even for Italian baroque the performance style is elaborate. Fagioli and his colleagues are not afraid to ornament, nor to use a very wide dynamic range. The result is wonderfully operatic, yet there is never any feeling that the performances are at odds with the artistic sensibilities of the composers. The timbral range of Fagioli's voice is also impressively wide. He can do the straight, focussed recitative style, but he knows that isn't very interesting so most of his singing on this disc is more florid. He has a vibrato that is very narrow but quite pronounced. I've no doubt there are a range of opinions as to how appropriate this is for 17th century repertoire, but it never feels out of place. In fact, it gives his lower register a valuable richness and his upper register a surprising power. His top notes are all there, but when he is at the top, there is always a slight sense of danger, a certain fragility of tone that keeps you on the edge of your seat. He can at times sound effeminate, but I suspect this a conscious choice, and an effect that he only uses sparingly. He often inflects the ends of phrases to the extent of endangering his intonation. But again, this is clearly a deliberate effect, and while he occasionally balances on the precipice, his tuning is never in any real danger. The repertoire here is made up of arias and cantatas by 17th and 18th century Italian composers: Frescobaldi, Monteverdi, Vivaldi, Paisiello and Handel (an honorary Italian for these purposes). Most of it is upbeat and elegant, and even though a number of opera composers are represented, there is little here that is overtly dramatic. Accompaniment and interludes are provided by an instrumental ensemble of lute, cello and harpsichord, who provide a more varied soundscape than that limited instrumentation suggests. 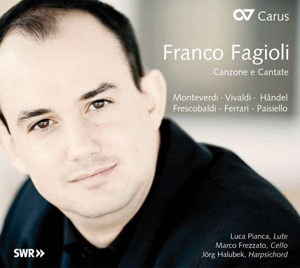 The sound is good, and Fagioli has chosen wisely (if it was his choice) to record this Italian repertoire in Germany rather than Italy, given the superior audio standards further north. The recording was made in a studio, but to listen to it you could mistake it for a church. That implies some kind of digital reverb, but if any has been applied it is done very tastefully. The packaging is stylish, although all the photos inside the liner are black and white, and the compressed page layouts make finding the English quite a project. In general though, this is another high standard release from Carus and yet another demonstration of the impressive results that can be achieved through the collaboration between a committed record label and a German broadcasting corporation, in this case SWR. If you're looking for a Christmas present for a baroque music lover who already has everything, look no further. A wonderful disc this, and a testament to yet another undervalued dimension of the artistry of Max Reger. Very few of the common complaints about Reger's music apply here, the music is consistently inspired, often light, elegant and wholly free from the stodginess that blights so many of his organ works. The broad theme of the compilation is secular choral music, but all that really means is that none of the music is specifically liturgical. Religious themes certainly make themselves felt, and the music moves between states of devotion, veneration and praise. A few of the poems that Reger sets are genuinely secular, those of Nikolas Lenau for example, and Gustav Falke, but a strong devotional undercurrent flows even though these works. It is a religious feeling borne out of a complete absence of irony, and for a composer working in the age of Mahler and Richard Strauss, the self-imposed seriousness of this aesthetic almost seems to have been transplanted from an earlier age. But while he is always serious, he is never dour. Stylistically, the most important predecessor to this music is Brahms, and you could be forgiven for occasionally mistaking individual passages here with some of Brahms' early choral works. But then you'll meet an unusual harmonic shift or a flowery piano interpolation that clearly belongs to a later time. Generally though, Reger's approach to choral writing is to use simple harmonies and homophonic textures, but to regularly jump between only distantly related harmonies, often several times within the span of a single phrase. The only exception to Reger's stylistic conventions is the 'Drei Gesänge' Op.111b for unaccompanied women's voices. Here the musical textures are even more simple, and the soundworld tends towards the medieval. This level of musical simplicity really brings out the best in Reger, he wasn't much of a melodist, yet there is a lyricism to much of his music that can really carry these simple, straightforward textures. Reger died young and the last year or two of his life were extraordinarily prolific. There seem to be many, many works – orchestral, piano, chamber, organ – that are habitually described as amongst his very last. The two major choral works that frame this programme, 'Der Einsiedler' and 'Requiem' apparently qualify too. Together they make up his Op.144 out of a total of 147, suggesting they are indeed very late. The music of both works is almost mystical in its use of widely spaced chords, unusual harmonic shifts and dreamy arpeggios in the accompaniment. The most interesting of the two is 'Requiem', a kind of abbreviated response to Brahms' 'German Requiem', with many stylistic links. Reger's Requiem is a term with complex textual issues. He began a setting of the Requiem mass in his younger years, but it remains incomplete, the fragments having the misleading opus number 145a. The Requiem that appears here is not a liturgical setting but rather a setting of a poem with the same name by Christian Friedrich Hubbel. To complicate matters further, this Requiem (and 'Der Einsiedler' too) were written for choir with orchestral accompaniment, but Reger's version with piano accompaniment predominates these days, to the extent that the work is played at all. The performances are all good. The choir 'Consonrtium' doesn't have a very inspiring name, but is an impressive ensemble. This is only their second disc, their first being an album of Brahms songs, to which this should provide the ideal compliment. The sound of the sopranos at the very top is sometimes a little abrasive, although I'm more inclined to blame the composer for his repeated use of the upper register than the singers for the occasional brittleness of texture. The choir is small, which aids the articulation and tuning, but sometimes makes for underpowered climaxes. Given that the Op.144 works were written with a full symphony orchestra in mind, the composer's intention must surely have been for a choir at least twice this size. But the music is flexible and retains its symphonic grandeur even in this more intimate environment. Not that it is all psuedo-symphonic, the other works on the disc, especially the 'Drei Gesänge' demonstrate the directness and simplicity that characterises much of Reger's music. It is a surprisingly varied programme, and an impressively performed disc. Any fans of Brahms' choral music would be well advised to take a chance on it. Jeremy Denk wants us to think of Ives as fun rather than dissonant. Fortunately, he doesn't consider the two mutually exclusive, and this recording of the Piano Sonatas excels in both. Whatever historical continuities there might be behind Ives' music (and I suspect they are very slight) it is important to treat him as an original, as a maverick. There is regularly a tension in Ives' music between the borrowed materials – the folk tunes, the allusions to Beethoven – and the context. I think one of the reasons why Denk's interpretations are so successful is that he accentuates that tension. Even when the composer is stating his apparently uncontroversial melodic ideas, there is always something slightly crazed about the way they are played. Denk provides copious liner notes, which are well-written and informative – Essays After a Sonata if you like. One interesting point he makes is that Ives was distancing himself from the European traditions that were dominant in America at the start of the 20th century. That opens up some intriguing possibilities in terms of performance. Is Denk fostering an un-European piano technique. Well, he is certainly unafraid of offending traditional European tastes. The sheer quantity of pedal in these performances could seem brash and extreme in anything from the European 19th century repertoire. And the almost sensationalist way in which Ives' dissonances are presented, or rather hammered home, seems somehow distinctively American. There is also an urgency about this music, which is distinctively Ives rather distinctively American perhaps, but it comes through in the way that build-ups are affected through accelerating the music while piling on the chords. The processes almost seem external to the music, but achieve their aim through the performer acting on every performance indication, and achieving that loyalty without every risking pedantry. That's not to suggest that there is no subtlety here. True, this music makes its greatest impact in its louder sections, but there is also an impressive gradation of dynamics and of articulation, although thick legato textures are the norm. It is easy to overlook the many quieter dissonances in these scores, but they allow Denk's technique to shine through in the evenness of balance and control of tone he achieves. The recorded sound is good, although perhaps a little resonant given the amount of pedalling. The piano has a round rather than a crisp tone, which if anything takes the edge of the most grating of the dissonances. The belated entry of the flute (marvellously played by Tara Helen O'Connor) at the end of the Concord Sonata, is presented with the ideal balance, the piano predominating throughout and the flute apparent, but always distant. 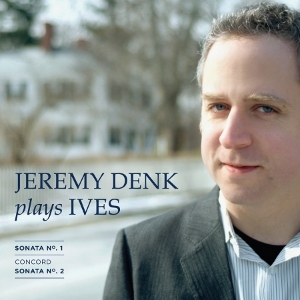 These Sonatas don't get the exposure they deserve, not on this side of the pond anyway, so Jeremy Denk's fine recording is welcome indeed. Both composer and performer are aware that the music needs some explaining, and the excellent liner notes here are almost as useful as the recording itself in getting to grips with the music. But it is the performance that really endears this disc. It isn't easy music, but as Denk demonstrates it is staggeringly original and, much more importantly, it's a lot of fun too. This CD marks the latest stage in a long a fruitful partnership between Delitiae Musicae and Naxos. 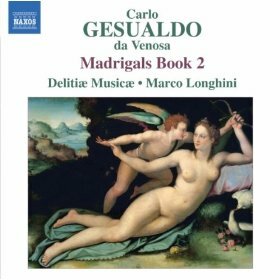 The last ten years have seen them release the complete Madrigals of Monteverdi, and now by way of a sequel they have turned to those of Gesualdo. The approach with both composers emphasises clarity of harmony and fluidity of line. The choir is made up of men's voices, and the impressive quality of the countertenors means that the timbre at the top of the textures matches almost perfectly with that at the bottom. The clarity of the diction is impressive, and shows the great advantage of a choir made up of native Italian speakers. With all this precision and clarity, there could be a danger of sterile, lifeless performance, but the sheer energy and variety of these recordings ensures that this is never a problem. Tempos are varied, without ever resorting to extremes, and the articulation follows the varied structures of the texts. The colour of the vocal tone is also impressively varied, often reined back to almost speech-like textures. That takes discipline and control even for a soloist, let alone for a choir. Gesualdo's first two books of madrigals were published around the same time at the end of the 16th century. We are not yet in the world of crunchy dissonances and beguiling harmonic shifts. Even so, this second book is clearly the work of a mature and distinctive composing voice. As with his later music, there is a vitality here in the rhythms that frees the harmonies to better illustrate the texts. There is a wonderful unpredictability about the harmony and the phrasing, often a phrase will seem to just run out steam and grind to a halt on some narrow spaced chord. Elsewhere phrases are elongated and interpolated to subtly change the structural balance. Two bonus tracks at the end of the disc present Gesualdo's complete surviving instrumental music. So we have a Canzon played on a muffled sounding clavichord (with some daringly chromatic ornaments) and a 'Gagliarda' here performed by a consort of viols. They are interesting appendices, but seem curiously out of place, especially since none of the instruments had been used to accompany the madrigals (five of which have impressively sensitive harpsichord accompaniment). The presence of the instrumental works is presumably a result of Naxos' 'record everything' approach to A&R, a laudable aim, even if it does lead to some strange couplings. The recorded sound is excellent. The individual voices are more distinct than in the earlier Monteverdi recordings, yet choral sound is equally unified. I notice they have moved to another Veronese church since their earliest Naxos recordings, and perhaps more than once. This church, Chiesa di San Pietro in Vincoli, has a warm acoustic, although this is balanced by some close micing. The packaging is impressive too, not only do we get detailed notes about the works by conductor (and edition editor) Marco Longhini, but also the latest instalment in a biography of the composer to be spread over the volumes of madrigals. Then there are the words, with elegant translations by Susannah Howe, and finally – and entirely out of keeping for Naxos – a photograph of the performers on the back of the liner. Naxos obviously think they are on to a winner with Delitiae Musicae. They are quite right, and I look forward to book 3, where things start getting seriously weird. Brahms is one of those industrious composers who seems to have condemned many of his works to undeserved obscurity just through his sheer industry. Unless you are a violinist or a Brahms aficionado, the chances are that your knowledge of his Violin Sonatas is sketchy at best. But they are great works, fine examples of the composer's later chamber music. 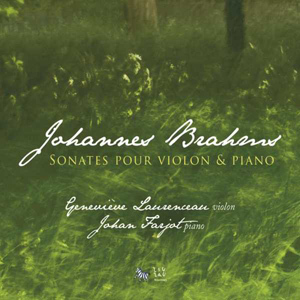 Brahms never had any hangups about presenting unadorned, simple music, even in his later years, and the beauty of much of this music stems from the uncluttered melodic style – a violin melody and a propulsive piano accompaniment, what more do you need? There are denser textures too, and plenty of contrapuntal episodes, although the clarity of texture is retained in these as well. There are similarities between these works and the Schumann Violin Sonatas. Like Schumann, Brahms has conveniently left three contributions to the genre that fit neatly onto a CD, and like Schumann's, each sonata is a perfectly crafted chamber work. But, in an unusual reversal of their relationship, Brahms' Violin Sonatas are the more modest. They are structurally more conservative, texturally lighter, and are based primarily on melodic invention rather than structurally integrating development. By the later years of Brahms' career, his writing for the violin and for the piano was as proficient as that of any 19th century composer. And while most of the textures in these sonatas sound straightforward, both players, and the violinist in particular, are being put through their paces in terms of technique. Brahms knows how to make the most of the lower end of the violin's range to create richness and depth. His use of the middle register is usually for very simple textures, which need to be straightforward without sounding naïve. And on the rare occasions he ventures about the stave, it is usually for dramatic effect, to give brilliance to a climax. Geneviève Laurenceau is at her best in the lower register. All those rich, flowing passages on the G string come across magnificently, and her precision with the tuning of double stopping in the lower register is faultless. The simple midrange textures also come across well, thanks in part to her vibrato, which she is able to reduce to the point where it is barely perceptible for those plain melodic expositions. I'm less impressed by the high passages, which bring out a slightly unpleasant edge in her tone. But as I say, Brahms rarely ventures up there anyway. Johan Farjot is a sympathetic pianist, always alert to the soloists changes of tempo and mood, both the subtle gradations and the immediate shifts. In general, he leaves all the drama to her and never competes for the limelight. That apparent subservience may be in part a result of the recording balance that favours the violin over the piano. That isn't usually a problem, but it can sometimes give the impression that the recording engineer knows better than either the composer or the performers how the instruments should interact. Whenever Brahms writes high pianissimo chords in the piano accompanying the violin in midrange, the piano seems very distant indeed. And given the discretion of the violin playing in these passages, the intervention at the mixing desk seems unnecessary. In general, though, this is a good recording, and is worth hearing simply for the quality of the violin playing. Brahms' chamber music repertoire contains many works that are more ambitious and involving than these, but it is a real strength of this performance that the players don't try to make more of the music than the notes on the page can justify. 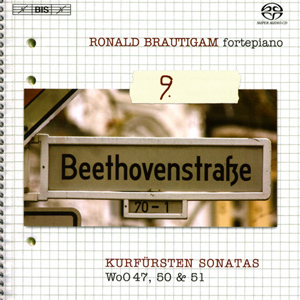 Ronald Brautigam could easily have overlooked these early unpublished works in his survey of Beethoven's piano music, but his fans will be grateful that he didn't. It's not the greatest music in the world, but that hasn't stopped the pianist preparing and presenting the works with the same level of care and dedication that he brings to the mature music. And the high-end audio is put to good use reproducing the nuanced textures of the fortepiano. The three 'Kurfürsten Sonatas' are the main offering here. The musical language of each of them is well within the rigorous formulaic conventions of the late 18th century, so if continual use of Alberti bass and whimsical cadential ornaments makes your teeth grate, this might not be for you. On the other hand, the sheer life the Brautigam brings to this music transcends all the conventions. He finds wonderful humour in many of the movements, as if they were the work of a younger and less selfconscious Haydn. The dynamic range that the fortepiano offers is surprising. Sure, it doesn't have the very loudest sonorities of a modern grand, but it has just about everything else. Brautigam really makes the most of these dynamic possibilities, often articulating the structure of a movement through the subtlest of gradations in crescendos or answering phrases. The bass end of the instrument is a little boxy, as you might expect, but Beethoven never demands more from his left hand figurations than the instrument can deliver. And again the high quality audio ensures that nothing in the middle or bass register is every obscured. The 'Zwei Sätze einer Sonatine' may be familiar to former piano students, who'll have come across them at about the grade 6 level. I did myself, but they never sounded like this when I played them. Brautigam again delivers a performance filled with bounce and vitality. So too in the '2 Leichte Sonatinen' and the 'Zwei Stücke für Klavier (Orphika)'. The justification for skipping these last two works in a Beethoven piano survey is even stronger, the former are only tentatively attributed to the composer, while the later was written for a completely different instrument. (The orphica was apparently a kind of small spinet.) Again, the performances are first rate. The music of these fragments and short movements is slightly more liberated from the stylistic conventions, at least in terms of texture, which ranges from the monophonic to the heavily chordal. There are no memorable melodies to speak of though, and it is easy to find yourself marvelling at the sound of the instrument and forgetting all about what is being played on it. And you really can't forget that this is a fortepiano. The sound is as civilised as you could hope from such an instrument, but it still has a certain rustic colour. Brautigam is conservative with his pedalling, or rather with his kneeing, as he is using a sustaining knee lever under the keyboard. But even with more knee, I suspect the instrument would produce a fairly dry sound. Fortunately, it is in the safe hands of the BIS engineers, who by volume 9 of this project have really mastered the instrument's recording potential. In lesser hands, the sound could seem distant and uninvolving, but here the fortepiano has a real presence. It's almost like having the instrument in front of you. 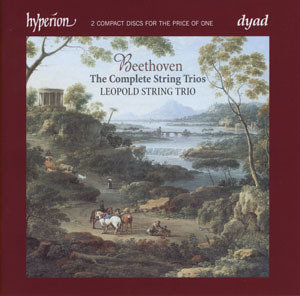 Repertoire-wise, this wouldn't be my first choice from the Brautigam Beethoven cycle, but in terms of performance and recording it is the equal of any of its predecessors. Juliane Banse has the ideal voice for Berg. She has the power and range of a soprano, but the richness and depth of an alto. Her vibrato is pronounced, but always very focussed and controlled. Most importantly of all, she sings with an intense expressivity which imparts depth and feeling into every phrase. From a lesser singer, these songs could sound like mere juvenilia, but Banse demonstrates that they are the work of a sophisticated and fully developed musical personality. Chronologically though, they are early works. Most of the songs here date from the first decade of the 20th century. Technically then, the music is still tonal, but everything here is forward looking. This is most evident in the lack of formal certainties; each song has a specific mood and pace, but there is no feeling of constraint from either the tonality or the form. The music floats and twists, dictated only by the expressive demands of the poet and the composer. 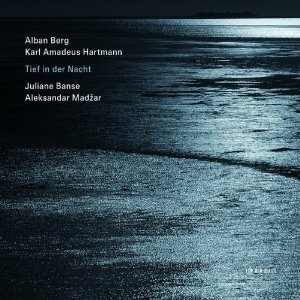 Berg's early songs cover quite a range of poets, and you'll hear, amongst others on this disc, Nikolaus Lenau, Goethe, Altenberg and Theodor Strom. If, like me, your German isn't quite up to this meaty fare, you'll need to refer to the excellently translated lyrics in the liner. However, if you can cope with the German, you will have no trouble in picking out every single word, such is the clarity of Banse's diction. The Berg portion of the programme concludes with two settings of Theodor Strom's 'Schliesse mir die Augen beide' dating from 1907 and 1925 respectively. The two tiny works (each is just over a minute) make a fascinating comparison. The latter setting demonstrates what happens to Berg's music when the already arbitrary framework of tonality is replaced with the equally arbitrary (at least to Berg's music) system of serialism. The similarities between the two works outweigh the differences, and it is almost as if Berg is resisting the formalising tendencies of serialism in 1925 almost as hard as he had been those of tonality in 1907. The three Hartmann songs that complete the programme fit well, but are clearly the music of a different composer and a different age. That said, they were originally part of a cantata (called 'Lamento') that was written in memory of Alban Berg. But Hartmann is a more down to earth composer. His phrasing is more four-square and his harmonies are more traditional. It is still great music though and it shows off another aspect of Banse's art, in particular her ability to sing in a robust, declamatory style while still retaining all the warmth and humanity that makes her Berg so special. Alexander Madžar provides the ideal accompaniment. Like Banse, he combines impressive technical control with the exceptional freedom of expression. Hartmann gives him more notes, both in terms of more heavily voiced chords and contrapuntal textures beneath the voice. But here too he retains a valuable sense of lightness. As ever from ECM, the recording quality is good, providing a vibrant and involving soundscape, and the packaging is excellent. The performers and the label have struck a rich seam with this early 20th century lieder. There is plenty more of it out there that could work wonders, I'm thinking of Zemlinsky perhaps, or Schreker, not to mention Webern. All could benefit as much as Berg and Hartmann have from the attentions of these fine performers.